I have my meat, but I don't have fire! I, sadly, no longer have a grill. However, I've been in the mood for a nice steak recently so I bought a 0.4 lb filet today. Here's my problem: I've never made filet. I have no idea what to do. I know well enough that I don't want to marinade it or anything, but wanted to know what the best way is to prepare it. I've got several types of pans and kitchen what-nots, so tell me what you would do. I'd like to make it tonight (Wednesday night). Re: I have my meat, but I don't have fire! Let your steak warm up to around room temperature before you start cooking it. Pre-heat your oven to around 450 or even 500. You also need a REALLY hot cast iron skillet. You can actually heat the skillet in the oven as it pre-heats. When the skillet is hot enough put it on your burner. Season your steak. Depending if your skillet has been properly seasoned, you may want to put a little bit of olive oil on each side of your steak. Sear the steak in the pan for about two minutes each side. Pop the skillet into the oven to finish cooking the steak to your desired doneness. It can be pretty smokey, so be prepared. soak it in beer first isnt that what people do? Drink the beer too. I thought you'd have more meat. I can't stress enough what a difference a good cast iron pan makes that is scorching hot. Definitely put oil on the steak, then salt & pepper If done correctly you will have a fine steak, and the smell will linger..... The smoke isn't too bad, just don't spill the oil, and the cast iron handle will be HOT, so make sure to have a solid oven mit and/or towel to wrap the handle before moving. You can buy a chimney, grate, and charcoal for under $20. Then you will have a mini grill for whenever you crave a steak. Maybe you need to get some Viagra. If you chose 4 or 5....please put down the skillet and hand in your man card. No ma'am. Although, I have seen the show, I didn't see an episode on cooking steaks like this. I learned this from my brother-in-law. He's a chef, and was making a big meal, but when it came time to grill the steaks, it was miserable and raining out, so he prepared them this way. I was shocked at how good they were. I thought grilling was the only way to go, but this was a real eye-opener. 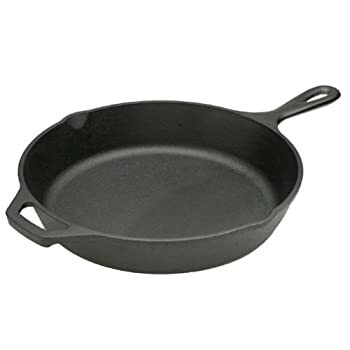 I don't have a cast-iron skillet, but I have a Calphalon skillet that the manufacturer says is oven-safe to 450°F. No pudding for you then! But how can I eat my meat without any pudding? Don't people have broilers anymore? I think you are confusing Medium with Medium-Well. Did it. I usually have it medium but it turned out medium rare. Delicious. If you use the broiler function on your oven it is basically a reverse grill. Go NOW and buy some cast iron! It's inexpensive and you'll thank yourself afterwards. Check Wal-Mart, they usually have it. The description above works really well but it is smokey. I don't have a good hood system, and only 1 window I can open, so I usually smoke my condo up when I do this. I've been keeping the temp down a bit and it keeps the smoke at a reasonable level. The real key though is to start with room temp meat. I like the Montreal Steak Seasoning you can find at the grocery store, but coarse black pepper and kosher salt is also really good too! Last edited by bdshort; 04-22-09 at 04:29 PM. Edit: Oops, I see you made your steak already. Glad to hear it turned out well! Actually, it turned out medium-rare. Keep up! Is the burner on or off? I'll be having this meal next week again! Mine was on, with the flame at max.